Dogs are flexible creatures, and they can sleep anywhere if they don’t have a choice. As fun as that may seem in your eyes, that’s not the best we can do for our furry friends. So, as a pet owner, you should strive to meet the basic needs of your pouch. Just like humans, dogs also need a place of comfort to consider their own and that is why every dog needs it own bed. The benefits, however, are more than just comfort. Let’s investigate. Besides looking cozy and adorable, a proper dog bed helps prevent behavioural issues as well. You will avoid finding your dog laying on your bed, a habit which in time may become a greater nuisance for you, your partner and the dog. You will break its little heart each time you order it to climb down and lay on the ground instead. So, to put it simply, owning dog bedding can give your dog its own personal space, and it won’t develop a habit to take over yours. Next, you should have in mind that improvised beds made from a pile of blankets or deformed pillows will not do the trick, on the contrary, these can be harmful to the dog’s health since it would probably have to deal with not enough space or deformed surface which is sure to limit its positions. Lack of sleep and improper positions can make your dog feel irritated and in pain. It would make you feel the same, wouldn’t it? Well, your fluffy friend is not that different when it comes to the need of comfortable dog bedding and quality sleep. Another vital perk is that a dog bed can keep your furry friend warm in wintertime and cool during hot summer days. 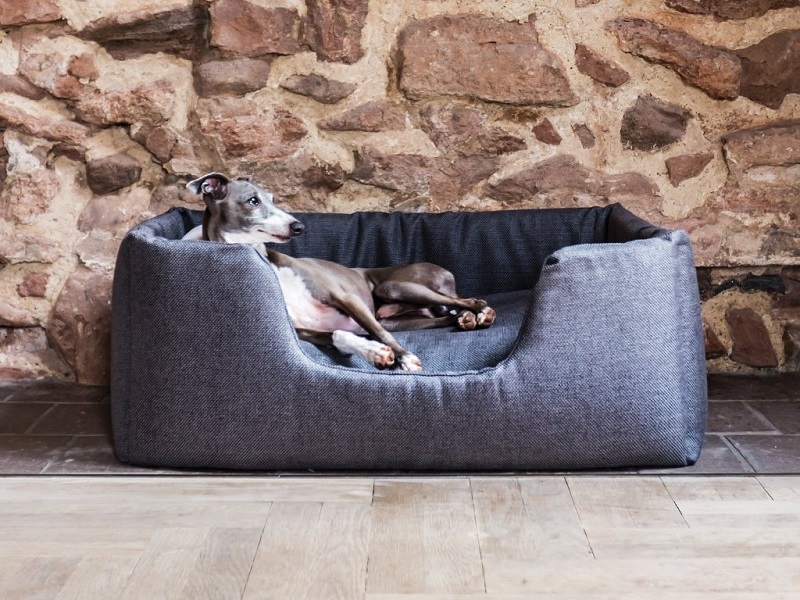 This is due tot the fact that dog beds offer insulation during both cold and hot seasons, acting as a protective shield against the cold floor and the hot ground. Sleeping on the floor, on the other hand, regardless of the season can result in serious health issues. A great number of fluffy canines tend to circle around and do some kneading or burrowing before they finally find the optimal position. Well, if they don’t have their own personal bed, they will do that to your sofa, armchair or your king size bed. This can cause unnecessary damage and create additional household costs. The solution is here, and it is extremely convenient for everyone involved. Just don’t forget, for all of this to work you should be careful when choosing, and decide on a high-quality model that meets all needs. Here’s what detail you ought to consider. First, think about proper size. Measure your dog before looking through the products available on the market, and make sure that you purchase one perfectly suitable for your dog. Also, have in mind its future size too (if it still hasn’t reached its full size) and the fact that it is going to stretch out while using it. Second, material. Water-resistant beds will keep your friend dry and are also easy to clean. If you like fluffier materials more, purchase a waterproof cover to place over it when in need. Next, opt for a bed that is dust-mite resistant, with an easy zip cover and a non-skid bottom to prevent slipping. And, finally, durability is also something you should be careful about since the bed is supposed to withstand long and at times rough usage.